As you know, smoothies are something I talk about often. 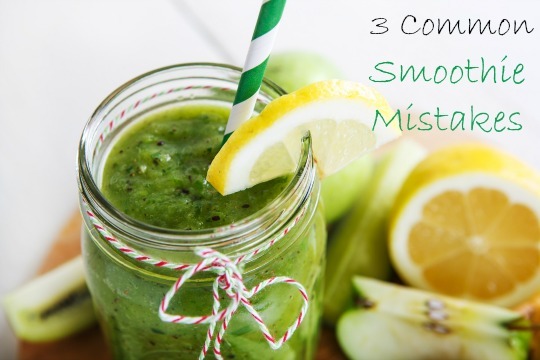 While smoothies used to be a novel idea, it now feels like everyone knows about the green smoothie and is making their own version for breakfast most days! Given that, I wanted to explain to you three common mistakes that I see people making that quickly turn what should be a healthy start to the day into a not-so-healthy start to the day. The rule of thumb I use is 1 cup at the most of fruit per serving. Beyond that, you are going to have a very sweet smoothie. Not to mention the fact that often the protein powders have a bit of stevia in them which further sweetens it. If you’re wanting to get really strict, choose low glycemic fruits like apples, pears, and berries. The fruit that is grown closer to the equator, as a rule of thumb, tends to have a higher sugar content. A major benefit of a smoothie is that it can provide you with more protein than the average cereal or toast breakfast, which is beneficial for your blood sugar and energy for the day. Without the added protein, whether it’s from protein powder or something like hemp hearts is crucial to balance out the fruit. It’s what also keeps you full. Ever had a smoothie that is just fruit and veg and been hungry 2 minutes later? That’s why! Also, the wrong protein can be an issue too. I write about how to choose a protein powder here, so it has more detail, but a common mistake is a heavily processed powder like the ones that have the muscle men on the front, and then a list of 25 ingredients you can’t pronounce. Another mistake is using a soy based protein powder, as soy has the ability to interfere with regular hormones in the body. I hope this one is obvious, but 1 cup of orange juice has 20+ grams of sugar. If it’s a post workout smoothie, pure coconut water could add some sweetness, but I recommend using water or unsweetened nut/seed milk (almond, coconut, flax, hemp).